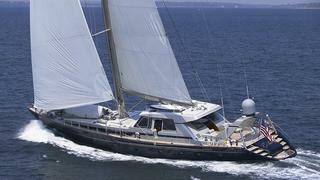 Grief, another price drop now as Kevin Merrigan at Northrop & Johnson sends word of a further cut, this time of $200,000, on the 35.05m sailing yacht Titan XIV. In superb condition, with an excellent charter record, Titan XIV is Lloyd’s classed and Marshall Islands Commercial Compliant, and was last refitted in 2004. Lying in West Palm Beach, Florida Titan XIV is now asking $2,490,000.